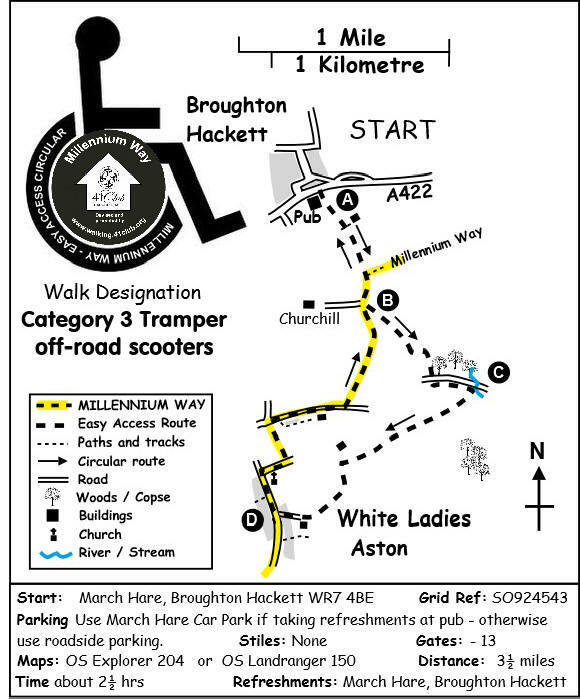 The MILLENNIUM WAY Easy Access Circular is a category 3 Tramper (off-road scooter) route and therefore offers an easy stile free walk in beautiful countryside, taking in the Parishes of Broughton Hackett and White Ladies Aston. Please note that sections of this walk can be muddy in places. The MILLENNIUM WAY section is clearly waymarked with the distinctive green and white circular waymarkers. Find out more about the walk by clicking on the information icon. Start from the March Hare car park. 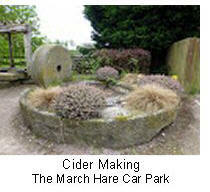 (If you do not intend to use the March Hare for rereshment or food please do not use the pub car park. Parking is available in the lay-by just up the road towards, or coming from, Upton Snodsbury). Exit car park by entrance furthest from the pub. Immediately go right, gently down the lane (not the main road) passing bright blue leisure sign ÂÂ– go gently downhill. At bottom is a car park . See gap ahead in trees. 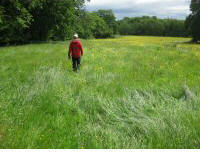 Take large metal gate on the right of the gap to avoid the cattle grid, and follow track up the open field. Where track goes left continue ahead over field to exit by metal gate. Go ahead with fence / hedge right. (Note - Midfield we join the Millennium Way for a very short stretch. Continue with fence / hedge right to find and take metal gate. Here we leave the Millennium Way). Go with hedge left, ignore metal gates in hedge left follow left-hand field edge closely with fence left crossing a small stream to exit field by wooden gate (in wet weather, if the stream cannot be crossed, it is possible to follow the stream to the far right of the field where usually the ground is firm). On crossing the stream go to the far left corner to exit by wooden gate) go left around field corner to take far corner metal gate. Go immediately right for 10 yards across the track, to the opposite metal gate. Take gate and immediately go left with hedge left. Come to corner with bridge/stream. With back to bridge go half left up field to take far corner gap with radar kissing gate. Take gate and ahead across field towards several trees on the right at top of field and follow waymarker keeping hedge right to exit by top right field corner. Take waymarked path on grassy track. At end of track swing left at waypost to the next waymark post on the edge of a field, go quarter right over field to find waypost. Take path to right of house and exit field by gravel track/gate to take cindered driveway leading to road..
At the road we re-join the Millennium Way. Go right on road and after some 200 yards find on the right wooden gates to St John the Baptist White Ladies Church. Take church driveway to church (Access to church appears reasonable there being no steps; if itÂÂ’s open you might like to take a moment to enter and relax in the peaceful atmosphere). Make your way round two sides of the church to exit by hedge gap to road. Go right a couple of yards and then take hedge gap left into field. Go with hedge right to finally exit by far corner gap. Go R on minor road, which passes houses R and becomes a track. Where track swings right watch for waymarked finger post left. Take way post line through shrub and exit by metal gate. Go quarter left across field to take mid hedge gated gap. Go half left to find ditch bridge with metal gate. Take gate, and go with hedge left following round field corner with hedge left to finally exit field by metal gate. Go immediately right 20 yards and take metal gate. Go ahead with fence / hedge left (At midfield once again we leave the Millennium Way), however we continue with fence / hedge left to finally exit by corner metal gate. Go ahead over field to come to downhill track to exit field by metal gate to left of gap avoiding cattle grid. Go ahead up metalled road to finally reach main road. Carefully turn left to enter March Hare car park. Known as Brocton Haket in the 13thC and Haggetts Broughton in the 16th C.
The village includes several timber-framed cottages, some black and white and others with brick filling; attached to Manor House Farm is a square timber-framed pigeon house of the 17th century. 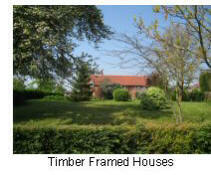 The houses are scattered along heavily-wooded lanes to the north of the main road. The three manor houses of Broughton were granted by King Edgar to Pershore Abbey in 972 but had been given to Westminster Abbey by the time of the Domesday book in 1086. Some of the lands were sold to Lord Coventry in 1632 and to this day the Earl of Coventry still owns estates in the area. 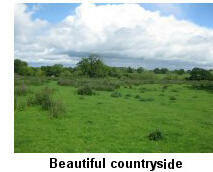 The Enclosure Act was passed in 1807and the villagers lost their grazing rights in 1808. 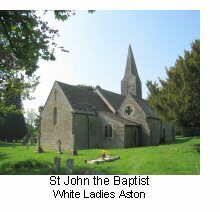 In its early days the parish was known as Aston Episcopi The name White Ladies Aston derives from an order of Cistercian Nuns from Whitstones, north of Wocester who were granted land in the parishin the mid 13thC. The church of St. John Baptist was enlarged with the aisle and vestry in 1861 but it stands largely unaltered since the 12th C. Windows have been inserted in the 14th century and another in the 15th. The round-headed south doorway is 12thC . The font, probably of the 13th century, is of a dark red sandstone with a twelve-sided bowl. There are three bells: the first dated 1707; the second 1636; the third inscribed 'Sancte Jacobpe, ora pro nobis,' with a crowned female head and a cross. 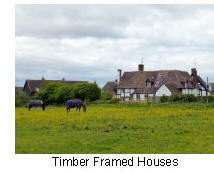 The village has many half timbered thatched houses. At the south end of the village lies Moat Farm complete with a moat. Aston Court was formerly the residence of the Good family. During the Civil War the Goods took the Royalist side, and Aston Court was plundered. On 28th August 1651 Cromwell stayed a night at a house in White Ladies Aston before the battle of Worcester.